These two old photographs are part of my collection. They depict a Bedouin and his camel in the desert. The Bedouin is doing his prayer. The pictures are not of the best quality, very little details are showing but still the topic is interesting. Circa 1930′s or 40′s, location unknown (probably North Africa since these come from a old French photo album). This entry was posted in camel pictures camel photos and tagged bedouin camel, bedouins, camels on April 11, 2013 by I love camels. Look at this hilarious print by artist persimew. I just love all the little details. Of course the camel is great, but have a closer look at that Sphinx! 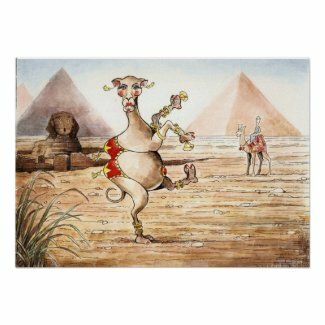 Now if you are looking for a whimsical camel poster, this maybe it! It’s available in various size and paper type. This entry was posted in camel pictures camel photos and tagged camel art, camel pictures, camel posters on April 7, 2013 by I love camels. In 1942 a lucky young woman was doing a trek in the desert. Here she is proudly posing, on the back of a camel. We will never know who she was, only that she was German and this being taken at the height of WWII North African Campaign. Just thought I shared this little photo with you. This entry was posted in camel pictures camel photos and tagged camel, camel photo, North African Campaign, old camel photo on April 5, 2013 by I love camels.